Ground cherries are a delicious husked fruit most modern gardeners have never heard of, grown, or eaten. That should change because ground cherries are extraordinarily delicious and nutritious! Ground cherries are in the genus Physalis – husked fruit in the nightshade family. Closely related to tomatillos, ground cherries are native to Mexico and the southern United States. They’re annual, heat-loving plants that die in late summer (in our zone, 7b) after they’re done producing hundreds of ground cherry fruits. Ground cherries taste like magic: notes of pineapple, strawberries, tomatoes, and tropical tang. Little is known about their history, but given the quality of flavor and their high nutrition, they were likely prized by the Native American cultures who grew them. One thing that is known is that early European settlers certainly prized them, and the fruit was quite popular for hundreds of years after European contact. It wasn’t until the early-mid 1900s that ground cherries began to disappear from American tables, as fewer people gardened and farmed, and began moving to cities where whatever the grocery store had to offer was what you ate. We think it’s high time these wonderful fruit make a big comeback. They’re wonderful eaten fresh and can also be made into outrageously good desserts and preserves. Germinate indoors: A little more time-consuming (you have to to keep track of watering your seedlings & making sure they are getting enough light), but you get earlier harvests because you can put out more mature ground cherry plants once your last frost date passes. Germinate outdoors via direct seeding into your soil. This method is a much easier and less time-consuming approach, but you don’t get yields until 6-8 weeks later in the season since your ground cherry seeds get a later start. Neither of these approaches are “right or wrong,” so use whichever method is best for you given the amount of time you have to commit, your level of gardening experience, and the resources available to you. Based on the approach you decide to take, read the next sections about starting your seeds indoors or outdoors. Find your last frost date here. 6-8 weeks before your last frost date is the ideal time to start your ground cherry seedlings indoors if you want to get an early jump on the growing season and get the largest possible yields. If your last frost-date has already passed, no problem! You can easily direct sow your ground cherry seeds into your garden. At Tyrant Farms, we have seeds from the previous year’s fruit pop up in our garden in May and June. That simply means we have a big second round of ground cherry fruit to enjoy once our earlier, indoor-started ground cherry plants peter out. Sowing depth: Sow your ground cherry seeds 1/4″ deep in your choice of seed starting mix or potting soil. Do NOT fill your seed cells with soil from your garden, since this tends to harden into an impenetrable brick. Instead, we recommend that you buy a ready-made organic seed starting mix or a light potting mix like Fox Farm potting soil. Experienced gardeners or gardeners starting large numbers of plants often prefer to mix their own seed starting mix. If you want to make you own seed starting mix, here’s our recipe. No matter which of these three options you use for your ground cherry seedlings, be sure to put a solid plastic seed tray or an old cookie sheet underneath them to keep water from dripping onto your floor or furniture. And don’t forget to label them with plant markers! WARMTH: The ideal temperature range for ground cherry seed germination is 75° – 85°F. Place your seed trays in a warm spot in your home (such as a sunny window). For best results, use a seed heat mat (which is also very helpful for starting other summer seeds like tomatoes, eggplants, peppers, etc.). We’ve had significantly better germination with our summer seeds since using a heat mat. Ground cherry germination time: If the soil is kept damp and temps are kept between 75° – 85°F, your ground cherry seedlings will germinate within 1 week. If the temperatures are much cooler than this, your seeds may take an additional 1 – 2 weeks to germinate. To help with germination, make sure your seed containers stay moist, but not wet. The moisture level should feel like a well wrung-out sponge. Also make sure to use a gentle watering method such as a misting bottle or a watering can with a very soft pour to prevent the seeds and soil from becoming dislodged. It’s important that your soil mix be thoroughly moistened BEFORE your seeds are added, or you’ll have difficulty getting the soil moist without dislodging the seeds. The frequency you’ll need to water your seedlings on an ongoing basis varies. Start by watering your seed containers every 24 hours unless they stay really damp. If that happens, hold off and check on them again in a few hours. Note: The soil will dry out faster on seedling heat mats or under hot lights. Again, go for the happy medium of soil with a similar dampness as a wrung-out sponge. Seeds allowed to sit in puddles quickly rot whereas tiny seedlings in crusty, dry soil will soon die due to lack of moisture. As soon as your seeds have germinated/sprouted above the soil surface, place them in front of a sunny, south-facing window in your home (e.g. the window that gets the most sunlight throughout the day). Newer, modern windows block a lot of the light spectrum that plants need to grow, so if you have energy-efficient windows, you might want to consider getting grow lights. Here’s how to build your own DIY grow light system. 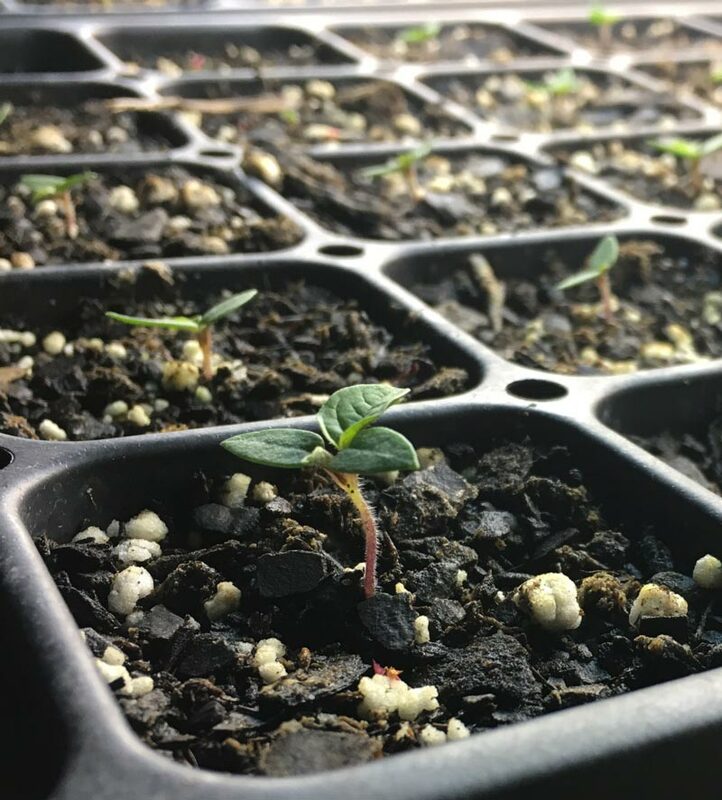 A tray of ground cherry seedlings growing under our indoor grow lights. It’s crucial that your ground cherry seedlings get adequate light—an absolute minimum of six hours of direct light—otherwise they’ll quickly become weak and “leggy” (tall and spindly). Tip: If growing in front of a window, periodically turn your seed trays so that the same side is not always facing towards the sunny window—this will prevent the side furthest away from the window/sun from getting leggy or stretching sideways towards the light. When the daytime temperatures begin to get into the 60s, you can start putting your ground cherry seedlings outside in direct sunlight. However, if you don’t “harden off” your seedlings before exposing them to direct, unfiltered sun, you risk them becoming sunburned. You can read more about how to harden off your seedlings in the Transplanting Outdoors section below. About 10-14 days after germination, your ground cherry seedlings will get their first true leaves. At this point, you’ll need to consider nutrition, depending on whether your seed starting mix did or did not contain nutrition. Use Organic Liquid Fertilizer – Start applying a water-diluted organic liquid fertilizer 1-2 times per week. (We like liquid kelp fertilizer.) Dilution ratios vary from product to product, but watering at half-strength (half of what the bottle recommends for feeding mature plants) is a good rule of thumb for seedlings. Be aware that over-fertilizing your plants can make them extra attractive to pest insects like aphids which can proliferate rapidly indoors since no predatory insects are around. Put Them In Larger Pots/Cells: This is also called “potting up” in gardening lingo. If your seedlings need nutrition or are running out of space in their smaller cells, you can transplant them into larger, 3-4 inch diameter pots or cells using a seed starting mix that contains worm castings, compost, or slow release organic fertilizer. Next, keep a close eye on your ground cherry seedlings to make sure they stay healthy: well-sunned, well-fed and well-watered until your last frost date has arrived. You’re almost ready for transplanting! After your last frost date has passed, directly sow your ground cherry seeds ¼ inch deep in your garden. Make sure the soil is moist, but not wet, until seed germination/sprouting. The Stick Trick: Once a ground cherry seed has sprouted, find a stick roughly the diameter of a toothpick and gently insert it into the ground directly next to your ground cherry seedling’s stem. The worm’s confuse are tricked into thinking the hard stick is the stem and move on. If you started your ground cherry seeds indoors, see the below instructions for a general hardening off schedule. If you germinated your seeds outside in your garden, you can skip this section and go to the Sun, Soil and Water section. Outdoor direct sunlight is always more intense than either indoor grow lights or light filtered through a window. Many new gardeners make the mistake of immediately transplanting their seedlings outdoors into direct sunlight before “hardening” them off. This mistake can cause extreme sunburn that severely damages or kills your plants. Days 1-3: Place your ground cherry seedlings outdoors in a shady spot that will only get 3-5 hours of direct sunlight throughout the day. Days 4-5: Place your seedlings in a slightly sunnier spot that will get about 5-6 hours of direct sunlight. Days 6-7: Place your seedlings in a full sun spot (6+ hours of direct sunlight). Water – If your seedlings’ leaves appear limp, this is likely due to lack of water. Try to keep their soil moist, but not wet. Sunburn – If you notice your seedling leaves beginning to look white and papery, they’ve gotten sunburned. Put them in a part-full shade spot for a few days and allow them to recover. Again, if you don’t properly harden off your seedlings, they can get severely sunburned, which will either slow their growth to a crawl while they recover or possibly kill them (if they’re small or weak). Cold – Also, be sure that you bring your ground cherry seedlings inside any time the temperatures drop below 50ºF. Once the last frost date for your area has arrived and your ground cherry seedlings are all hardened off, it’s time to plant them outdoors. Like tomatoes (fellow nightshade plants) ground cherries have small “hairs” (called adventitious roots) on their stems that can turn into actual soil roots. Ground cherry plants tend to be a bit slower-growing than tomatoes, so we don’t trim their lower branches and bury their stems like we do when we transplant tomatoes. We like to place the ground cherry root ball only about ⅛-¼” deeper than it was in its pot so that we can sprinkle a thin coat of our garden’s soil followed by around ½-1″ of mulch over the potting soil root ball (make sure not to pile soil or mulch directly against the plant’s stem) to protect it from drying out at a different rate than its surroundings. Castings/compost – Dig a 1′ x 1′ hole and fill it with 50% castings and 50% garden soil before transplanting. Organic fertilizer – Loosen the soil in a spot about 3-4x larger than the seedling root ball. Mix in slow release fertilizer at the application rate described on the product package, then transplant the seedling into the spot. When filling the hole back in around the root ball, the soil used should be actual soil. You should not fill the hole with recognizable chunks of mulch, kitchen scraps, leaves, lawn clippings, or other undecomposed organic matter. We can’t overemphasize how important top-dressing your beds with wood chips or mulch is for building and maintaining healthy soil, regulating soil moisture & temperature, and blocking unwanted plants – aka “weeds.” After you plant your ground cherry seedlings, make sure to put at least a few inches of mulch on top of the soil surface around your plants, if it’s not already there. Again, mulches should always remain on the surface of the soil, not against the roots of the plant (aka “top-dressing). If you have ever heard of mulches or compost “stealing” nutrients from garden plants, mixing these items into the soil instead of letting them sit on top of the soil is what causes this problem. You can read more about your plant’s long term soil requirements in the Sun, Soil, and Water section below. Immediately after transplanting, give each newly planted ground cherry seedlings a deep watering around the base of the plant. Ground cherry plants thrive in full-sun spots (6-8+ hours direct sunlight per day). They can tolerate part shade but will produce less fruit. Ground cherry plants perform best in rich soil with lots of organic matter. using compost from hot composting methods (Berkeley method) or worm castings. Either: a) Apply the compost/castings on top of your beds, or b) Make actively aerated compost tea (AACT) to use as a soil drench or foliar spray. (Option b gives you the most bang for your buck.) Both methods of application drastically increase the quantity and diversity of beneficial microbes in your soil and on your plants. All five of these soil building techniques can improve your soil fertility to the point that your plants will not require any additional fertilizer and virtually no additional water throughout the growing season once their root systems get established. We recommend that you NOT use non-organic/synthetic fertilizers as these will have a compounding harmful effect on your soil over time. Instead, plan to build your soil fertility for the long-term using techniques that build biological soil fertility. Ground cherries need approximately 1″ of water per week. If your soil is healthy, your plants have established their root systems and rain is regular, you may not need to provide any additional water to your mature ground cherry plants. If you do need to water, water deeply (shallow watering can lead to shallower root systems). Definition: A plant “guild” is a polyculture plant system (multiple plant species planted together) purposefully designed to create symbiotic relationships between species, increase plant productivity and generate higher survival rates amongst the individual plants in the guild system. If you’ve ever visited a “wild” ecosystem (mature forest or prairie), you’ve unknowingly seen plant guilds. Like people, plants tend to perform better in communities than they do as isolated individuals. Ground cherry plants are somewhat inconspicuous in the landscape, though that can be a positive feature (they are certainly handsome enough, just not very showy). They have a rounded, shrubby growth habit and can usually be kept pretty tidy. If they ramble you can either stake or prune them to force them to behave and they’ll continue growing and producing unfazed. If you want to use ground cherries as a focal point, your best bet is to elevate them off the ground so they are closer to eye level. The plethora of little developing husks look like beautiful miniature lanterns and are definitely a conversation starter. If you have a taller bed held back by a retaining wall, this can be the perfect “wow” plant to place at the edge of it. If you don’t have a raised bed, ground cherries are still quite useful for aesthetic edible designs. They can be employed as a mostly green hedge behind shorter, showier plants (maybe some edible flowers like nasturtiums or borage) or they can be used to delineate a tidy border in front of taller vegetables like tomatoes, trellised cucumbers, or okra. In both applications, your ground cherries will also help shade and protect the soil from sunlight and weed competition. We advise that you also consider how easy the plants are to access as well as using a mulch underneath that will keep the husks relatively dry when they ripen and fall to the ground. Container Spacing for maximum harvest: Minimum container size – 5 gallons, approx. 12 – 14 in. diameter, 8 – 14 in. deep. A ground cherry plant growing in a pot in a patio garden. Use ground cherries along with a showy, taller plant and a dramatic, trailing plant and you’ll have the ideal partner to add appeal without stealing the spotlight. 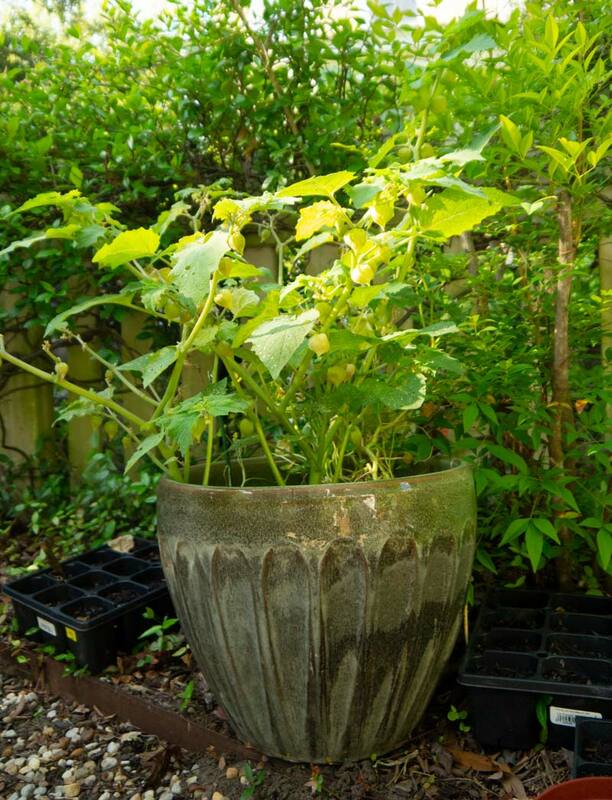 Make sure your container is large enough to accommodate the 5 minimum gallons of soil your ground cherry plant will need in addition to soil for any other plants you decide to include. For a frothy, lacy look you might consider a more muted “thriller” such as Queen Anne’s lace (or just replant a couple roots from your last carrot harvest and let them bloom—they happen to be the exact same thing as this beloved wildflower but have been bred to produce a tastier root). Add a “spiller” of some creamy-hued trailing nasturtiums or a glossy, prostrate rosemary and your container is ready for a wedding registry table or a Victorian tea party. If quiet displays aren’t your thing, we suggest you combine a colorful pot with thriller options like brightly colored greens (magenta orach or any non-green shade of amaranth are good options). Your spiller should also be notably conspicuous so try some red or pink tumbling tomatoes or perhaps a few vines of purple-podded pole beans. Indoor plants and seedlings are more susceptible to certain pests and diseases than outdoor plants, since there aren’t predators around to manage their populations. Description: Small sap-sucking insects that proliferate on young plant stems and the underside of young leaves. Symptoms: Sticky leaves; curled leaves; weakened, limp or dying plants despite adequate water and nutrition. Organic Treatment: insecticidal soaps, horticultural oil sprays, organic insecticides (neem oil works great.). The more time you can get your seedlings outdoors, the less problems you’ll have from aphids. Aphids are a favorite snack for ladybugs, parasitoid wasps, and other predatory insects that you probably don’t have in abundance inside your home. Description: Small, white flies that proliferate underneath leaves. Symptoms and Organic Treatment: Same as aphids (above). Description: Small dark-colored gnats; the small, white-colored larvae live in soil and eat the roots of young seedlings. Symptoms: Seedling growth rate slows and seedlings eventually die if untreated. Organic Treatment: For prevention or treatment of fungus gnats, add beneficial/predatory nematodes to your soil. Description: Death of young seedlings caused by fungal disease. Symptoms: Young seedlings wither and die, sometimes suddenly. Organic Treatment: Prevention is the best cure for damping off. Two most important methods of prevention: 1) don’t overwater, and 2) try to keep your seedlings in an area with good air flow. Additional prevention methods: Use a sterile potting mix. Sterilize your reused seed trays before using them. If a seedling or seedling tray gets damping off, immediately remove it from your seedling area. Relative to other summer garden plants we grow, ground cherries are very disease and pest-resistant. Grown in rich, biologically active soil which keeps the plants healthy, they can pretty well ward off any pest or pathogen. However, the full range of possible outdoor pests and diseases that can harm ground cherry plants is too long to list here. Unfortunately, since ground cherries are uncommon relative to other crops (like tomatoes and eggplants) there hasn’t been very much public research done to help identify and recommend treatment measures for the various pests and diseases that can affect these wonderful plants. We’ve occasionally had problems with leaf-footed bugs and their small, red-colored offspring (“nymphs”) on some of our ground cherry plants late in the summer growing season. When this happens, we’ve found it helpful to fill up a small pail with soapy water, put on a pair of rubber (or gardening) gloves and either knock the leaf-footed bugs into the pail of soapy water or pluck them off with gloved hands and place them in the pail. The bugs emit a harmless but fowl odor, so you’ll want to wear gloves if you plan to touch them. A healthy garden needs pest insects. Pest species provide food for beneficial species. A garden ecosystem that’s teeming with life will tend to hold the population of any one species in check. We’ve found that by focusing on improving our soil health and using polyculture plant systems that attract and nurture a wide variety of insects, we’ve virtually eliminated all pest and disease problems from our garden. We’d like to encourage you to be thoughtful in your approach to these potential problems. Is your soil healthy and teeming with microbial life? Have you planted other beneficial plants throughout your garden system that might help with the problem? If you wait a few days, will the “pest” become the food of a predator? Observe your garden system and think holistically before taking any action that could disrupt the web of life. Pesticides kill beneficial insects too, not just pest insects; fungicides kill beneficial funguses too, not just “bad” funguses; etc. Personally, we’d rather lose a plant than accidentally harm or kill wildlife. You’re probably not going to find them at your local grocery store. Their flavor is exceptional. Even if you can find them at your local grocery store, they’re not going to be as ripe, delicious, and nutritious as the ones you grow and pick fresh from your own organic garden. When the fruit is ripe, ground cherry husks will turn brown and the fruit will fall right off the bush. A gentle shake on the plant will send the ripe fruit cascading to the ground. Once the husk is peeled, the ripe fruit inside should be golden yellow in color. How do you eat ground cherries? Ground cherries are so good that we usually eat them right on the spot as soon as we pick them. However, occasionally we’ll exercise a little discipline (usually when we have more than we can possibly eat all at once) and store up enough to make preserves, desserts, or refreshing summer drinks. Our favorite ground cherry recipe: Tyrant Farms’ ground cherry preserves with vanilla and brandy. There’s no wrong way to eat a ground cherry, so experiment and enjoy! Saving seeds is an important part of being a full-circle organic gardener. This critical step ensures that seeds are passed down from generation to generation, so please give it a try and also be sure to share your seeds with other people! Another benefit: seeds you’ve properly saved from your own garden will be better adapted to your specific growing environment via natural epigenetic processes. Pick the Best – Pick the best, fully ripened (or even a bit past ripe) ground cherries from your healthiest plants. Fermentation – Scoop or pour out the ground cherry seeds into a small glass or jar. Immediately label the jar so you remember the variety of seed you’re saving. Add Water and Wait – Add a small amount of water (half cup or less depending on the size of your container). Then set your labeled container aside for 3-5 days in an indoor spot out of direct sun. We typically put a piece of plastic wrap with small holes punched in it over the top of our container, but you can also just leave the container open if you prefer. A film will form on the top. Separate the Seeds – After 3-5 days, the mix will begin to ferment. Remove the film of mold on the top. Then add a bit more water to the container and stir. Any bad seeds will float to the surface, and the good seeds will sink. Carefully skim or pour off the bad seeds and gunk from the top of the water. Pour the good seeds through a fine mesh screen (a metal pasta strainer works well). Dry – Place the ground cherry seeds on a drying surface that they won’t stick to. A ceramic plate or cookie sheet works well (paper towels dry the seeds well, but tend to stick). Label your drying plates if you have multiple seed varieties. Give your seeds a couple of weeks to fully dry, especially if you live in a humid environment like we do. Store – Once your seeds are fully dry, store them in an airtight container (add rice or silica packages to hold any moisture). You can also store the seeds in envelopes, although this will make them more susceptible to moisture damage over the course of several years. How long do ground cherry seeds last? Your new ground cherry seeds can remain viable (e.g. able to be grown) for 4-6 years. Plant and share them so their grow journey continues!